Looking for a beautiful but modest dress? K Couture is made to order. You’ll find the stunning formalwear you’re looking for—with longer sleeves, higher necklines and lower hemlines—all in matching colors and fabrics. Add perfectly coordinated menswear pieces, and your bridal party will be as beautiful as the wedding you’ve envisioned. 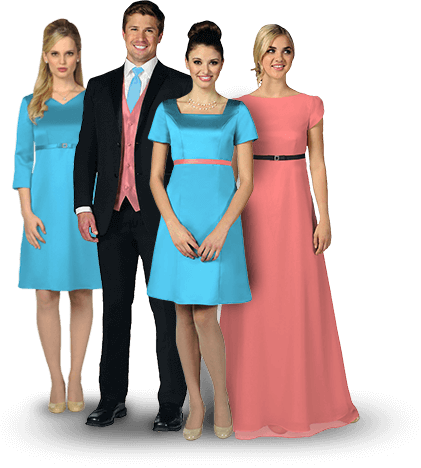 We design and sew everything in house, which means everyone in your group will get a perfect fit, and be picture perfect on your special day. After searching through so many bridesmaids dress options that were tight and unbelievably skimpy, this dress was an absolute breath of fresh air. I feel so blessed to have found this website.